The Feral Cat Rescue Project photo blog is an attempt to document the lives of feral cats and their plight. I do my best to feed and care for them, and to protect them from danger. The Feral Cat Rescue Project is not a 501(c)3 charity; it's just the effort of one impoverished artist. I'm a graphic layout artist, a painter and documentary photographer by trade, having worked for various newspapers and publishers - and now a freelancer. I edit books, too. Having traveled around the U.S. in my career, living in places like Washington, DC-Virginia, Maryland, and Idaho, I just happened to end up back in my home area where I parked my RV at my sister's farm. I quickly discovered that dairy farm areas have a lot of feral cats: mostly it's because people dump cats around farms in the mistaken belief that they are good places for cats to live. They are not. Although I was concerned about these kitties, I didn't really take an active roll in their rescue until a tragic event. 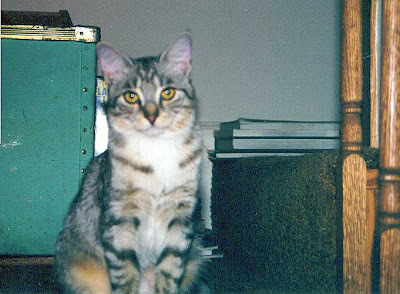 On June 3rd, 2003, my beloved tabby cat who had traveled with me across the country and had seen much of America with me was viciously killed by an uncaring neighbor's dog. I wrote about my late kitty here. The loss of my cat was devastating and even to this day I still think about her a lot. The only thing I found that could assuage my grief and keep me from doing something terrible was to start helping the poor, suffering feral cats in the area, and that is why I became a rescuer (of sorts). So you see, it was my grief that drove me to help these animals. Perhaps it was a selfish reason after all - but now I really love and identify with these poor unfortunate cats. 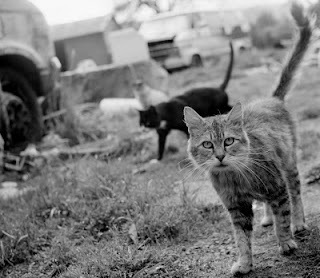 If you have followed my story from my art or photo sites, you know that I had a pretty rough beginning to my life; I grew up in a family that was often homeless and filled with violence ...much like the lives of feral cats. 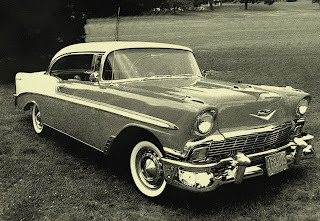 We often didn't have food and we lived in a car. It isn't pretty. Except for the rare kindness of a random stranger, I would not be here today. So when I look at the feral cats, I feel their suffering - and I also see something of myself, because I began life as a feral human; homeless and unwanted. I want to help them - they are living beings, after all, not objects. They deserve better lives than fate has dictated. Inadequate though it may be, I do my part to make their lives a little better: I feed the ferals twice a day. I trap them regularly for trips to the vet to be spayed/neutered (all at my own expense). And when I capture sick kittens, I try to nurse them back to health and find homes for them. My philosophy about feral cats is different from many others who deal with them. First and foremost, I believe that they are part of nature; our natural, wild world. While I would like to see the tame ones find homes, I don't think there is anything wrong with wild cats living like cats - like their ancestors did for millions of years before people captured and 'tamed' them. They aren't tame now - they are wild, and many don't want to accept that. Like it or not, they are WILD cats. The fact that they were descended from cats that were once pets (in some cases many many generations ago) should make no difference. They are part of nature, now, and they have every bit as much right to exist as any other wild creature. Really, I believe this is something we need to get over: A recent study in Scotland concluded that it was nearly impossible to distinguish native Scottish wild cats from the area feral cats. They argued that even though the current day "wild cat" is at least part "domestic" cat, they are worth protecting as a native species.1 For any reasonable purpose a wild cat and a feral cat are the same thing.2 I agree, and we need to get with the program in America! I think that too many people try to segregate these cats and treat them as if they were something else. The law certainly acts that way! Your local law enforcement feels no compunction about killing feral cats, because (apparently) they "don't belong here." Well you know what? Neither do people. But we're here anyway. While we're on the subject, it is important to distinguish between wild or feral cats and so-called "stray" cats. 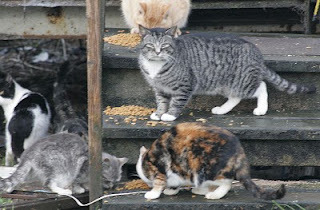 Feral cats are wild cats; they were born wild and live as wild animals. "Stray" cats aren't wild and they aren't really stray at all: Cat's don't just wander away from their homes (stray) they are DISCARDED by people who have failed in their basic capacity as humans to care for creatures that were entrusted to them. I see new discarded cats arriving among the ferals regularly. At least, the lucky ones make it here. Most discarded cats starve to death or are killed by predators or people long before they reach the fortunate safe haven of my sister's farm and the surrounding farms. There were a few undocumented years of helping ferals before I started this blog. Some of those cats are noted at my art site - this is an art project as well as a rescue project, after all. Eventually I decided that poor kitties deserved to be seen by the world, to give their lives meaning to a broader audience, so I started photographing and documenting them, giving faces to their stories and putting their lives into words. Thus we have the Feral Kitten-Cat Rescue Project. While I once had a great job as a web programmer and graphic designer for books and magazines, today I live pretty much like the feral cats I care for. It's kind of like going back to my childhood. We're all in this together. Thank you for allowing me to share the story of these cats. Feral Kitten How-To - Care, Feeding, Keeping Your Kitten Alive! 2002-2019 Chriss Pagani - oregonpainter.tv ... NOT a 501(c).3. Picture Window theme. Powered by Blogger.